…after moving to Kupferzell into new offices there is a steady expanding development during the following years. The number of employees, the product range and the customer base are growing fast. In September the first patent for snap ferrite housings is registered. eiSos® becomes a registered trademark. eiSos® is an abbreviation of EMC & Inductive Solutions. 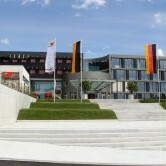 The building in Kupferzell is now too small for the employees in the administration and plans are made for a new headquarters. The work starts on 27th of March in Waldenburg. Furthermore on 6th of August 2001 is the foundation of Wurth Electronics USA . This subsidiary is the North America Central Distribution Center for Würth Elektronik. Managing directors are Oliver Konz and Norbert Heckmann. Two more mile stones are reached this year…. The move into the new building in Waldenburg provides enough space to guarantee future growth. This year the company name changes to Würth Elektronik eiSos GmbH & Co. KG and the former division becomes a legally independent company within the Würth Elektronik Group. The former heads of the division Norbert Heckmann and Oliver Konz become the managing directors of this company. Now we have more than 150 employees in the administration. The new warehouse in Waldenburg has three times more space than the old warehouse. Würth Elektronik constantly expands its prodcut range: In 2004 Transformers and RF components were added to their standard product range. Würth Elektronik eiSos aquires the rodcore inductor specialist iBE Induktive Bauelemente GmbH in Thyrnau, Germany. iBE manufacures customer-specfic rodcore inductors for the automotive sector. Würth Elektronik goes Electromechanic. The divison WE Radialex starts internatonally to sell connectors, varistors and assembly technique. At the WE headquarters in Waldenburg, Germany the new warehouse is ready. The new warehouse has 4-times the capacity of the former warehouse and guarantees availability and short delievery times for our customers. Würth Elektronik aquires Midcom Inc. which is located in Watertown, South Dakota. Since 30 years Midcom is one of world's leading manufacturer of customized transformers for LAN, Power and Telecom applications. Wurth Electronics Midcom, Inc. is an affiliated company and handles and processes sales in the U.S. The international expansions continues. In Israel and Poland we now have also a technical sales force who support our customers directly on site. Würth Elektronik expands its international activities despite of the economic and financial crisis. Direct sales starts in Denmark to support the customers directly on site. The design of offline transformer for energy saving electronic devices opens the door to future technologies. Würth Elektronik publishes the design guide "Trilogy of Connectors". Direct sales starts in Norway and Turkey. On Sunday, 29th April Würth Elektronik celebrates 10 years headquarter in Waldenburg and opening of the new technology center. With the extension (10 million €) jobs for over 300 employees are created. The technology center includes several labs and engineering rooms as well as multimedia offices for further dynamic growth. Würth Elektronik eiSos opened its local Design & Application Center in Munich Garching on September, 9th which offers the engineers who work there space for ideas to develop new electronic components and gives Sales direct access to customers and IC manufacturers located in the Munich area. Würth Elektronik eiSos signs on May, 21st a contract for the purchase of the Italian connector manufacturer Stelvio Kontek SpA with its headquarters in Oggiono to further extend its global activities in the connector business sector. Würth Elektronik eiSos opened the Competence Center in Berlin, where hardware and software engineers develop new solution concepts in application development. In addition, Würth Elektronik eiSos opened the Design and Spplication Center in Barcelona to develop customer-specific solutions and applications and to cooperate with the University of Valencia. On June, 28th the expansion of the logistics center of Würth Elektronik eiSos GmbH & Co. KG was officially inaugurated with representatives from politics, business and the Würth Group. With the large-scale project a doubling of the storage capacity was achieved, now 14000 different items are available from stock and 4000 withdrawals are possible every day. AMBER Wireless GmbH is now part of Würth Elektronik eiSos GmbH & Co. KG. Founded in 1998, the company is a German, owner-managed electronics company specializing in the development, manufacture and sale of wireless data transmission products.